Explanation: What's that diamond in the sky? Cruising though space, sometimes you'll come across an unusual object. Such was the case on Friday for ESA's Rosetta spacecraft on its way to comet Churyumov-Gerasimenko in 2014. Robotic Rosetta buzzed right by the main belt asteroid 2867 ?teins, taking many pictures, some of which have been compiled into a short video. At first glance, Steins looked like a 5-kilometer wide diamond, but as Rosetta shot by, craters and a more extended shape become evident. 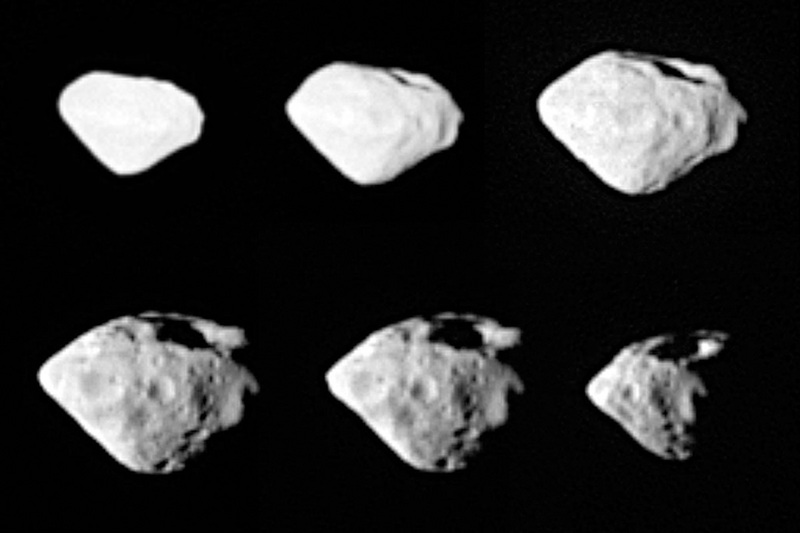 In the above sequence of six images, a notable chain of craters is evident vertically on the asteroid's surface, most probably caused by a chance collision with a stream of meteors. Space scientists will now study the data taken by Rosetta of asteroid Steins in an effort to better understand its composition, origin, and why the asteroid reflects light so well. As the Earth-bound scientists toil, Rosetta itself will continue to zoom across our Solar System, next swooping again by the Earth in 2009 November, flying by asteroid 21 Lutetia in 2010 July, and finally landing on comet Churyumov-Gerasimenko in 2014 November.